I was very pleased to see another go-round of Warner’s Saturday Morning Cartoons compilations. They make very interesting samplers of what was happening in kid-vid in both the 1960s and 1970s, so they’re prime fare for baby boomers like me. Although you have to keep in mind that it’s not a complete snapshot of the era. Due to licensing restrictions (or possibly availability), the selections are pretty much limited to properties that Warner currently controls, represented here by the Hanna Barbera, Warner Bros., and MGM cartoon libraries. In addition, there are a couple more Warner Bros. compilations (The Bugs Bunny Show and The Road Runner Show), both extremely popular, but both kinda redundant here as Warner has done a really good job of compiling Bugs Bunny and friends elsewhere on DVD (except for no collector set this year — hope they get back on track for next year). It is, however, really great to see and hear the original opening sequences and theme songs for the shows — especially that quirky only-of-its-era Road Runner song (“Road Runner goes Beep Beep!” and “That coyote is really a crazy clown!”). Some of the original between-cartoon bumpers are also shown, which is a nice touch. Later, both shows were combined into the mega-length Bugs Bunny Road Runner Show (see the 1970s Volume 2 collection, although it actually began in 1968). Also on this set is The Tom & Jerry Show, making its first appearance in these compilations, and best known for appearing on Sunday mornings, although the show began on Saturdays in 1965 before moving to Sundays in 1967, remaining there until 1972. While it is great to see it represented here (especially with some of the Chuck Jones bumpers included), the Tom and Jerry cartoons have been endlessly repackaged by Warners for the last several years. There are some new things here — although I have to admit that as a kid I seldom watched any of them, as I was watching something else on some other stations (in those long-ago days before recording VCRs and DVDs or time-shifting DVRs). Space Kidettes/Young Samson and Goliath never actually appeared on Saturday morning — at least in this configuration. Young Samson did — solo — for one season beginning in 1967, before being pared with Space Kidettes in syndication. Young Samson is best described as a a cross between Marvel Comics’ Roy Thomas-revised version of Captain Marvel (a young teen transforms into a great hero by slamming his magic wristbands together) and later animated series He-Man and the Masters of the Universe. Young Samson turned into the adult superhero version of the biblical Samson, and his dog Goliath transformed into a super-powered lion. (Oddly, they were never shown turning back into their original forms in the cartoon.) Yeah, it was kinda dumb. 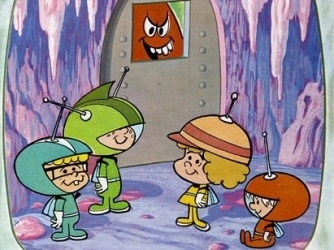 Space Kidettes appeared on Saturday morning in 1966, also for one season only. (Young Samson took over its time slot the following year). Space Kidettes was a very cute series featuring four very young kids (Scooter, Snoopy, Jennie, and Count Down) and their dog Pup Star who lived in outer space (seemingly without parents) and hung out in their space clubhouse. Unfortunately they were constantly menaced by the evil but inept Captain Spacehook and his equally inept henchman Static (both of whom inexplicably had British accents). Nothing in this series was ever explained, as it was primarily aimed at very young kids. In fact, its pairing with Young Samson in syndication was also a mystery as the two series had absolutely nothing in common, other than both being produced by Hanna Barbera, and both are largely forgotten today. Speaking of forgotten Hanna Barbera characters, a whole bunch of them all appeared on something which is called here The Wally Gator Show but was really titled The Hanna Barbera New Cartoon Series. This series also never actually appeared on Saturday Mornings (at least on the networks) but appeared in syndication (frequently cut up into its component parts) beginning in 1962. It consisted of three separate cartoons: Wally Gator (voiced by the great Daws Butler doing an Ed Wynn impersonation) is an alligator who normally lives in the City Zoo, but he loves to escape and have adventures on the outside. Mr Twiddle (Don Messick) is Wally’s frequently exasperated zookeeper. This concept was later expanded for Help! It’s the Hair Bear Bunch! (see the 1970s Volume 2). Touché Turtle and Dum Dum were a pair of swashbuckling heroes who were constantly saving various members of royalty in distress. Touché (voiced by Bill Thomson) was brave and dashing, Dum Dum (Alan Reed) was dumb. (Duh.) Elements of this cartoon were better used in subsequent cartoons, including Ricochet Rabbit (the comedic pairing) and Yippee, Yappie, and Yahooie (funny swordsmen). Lippy the Lion and Hardy Har-Har was one of Hanna Barbera’s funniest teams, with Lippy (Daws Butler) constantly attempting get-rich-quick schemes which inevitably backfired on Hardy (a deadpan Mel Blanc). Hardy was one of HB’s funniest characters — a laughing hyena who never laughed. Hardy instead seemed to be in constant agony, as well as being an eternal pessimist. Hardy could always be counted on to moan “Oh me, oh my, oh dear” at least a dozen times in each cartoon. He was a much-loved role model for me (along with Daffy Duck and Eeyore). All of these characters later infrequently appeared in other HB “gang” shows like Yogi’s Gang. Wally was a regular on Laff-A-Lympics, and the original cartoons occasionally pop up on Boomerang — unfortunately as unscheduled “time-fillers” between shows. A DVD set of these cartoons was originally announced in 2006 but was later canceled due to the poor condition of the master prints. Too bad — that would have been a nice set and a great way to see these undeservingly forgotten characters. The Adventures of Gullivar is another largely forgotten Hanna Barbera production, which originally aired between 1968 and 1970, and was later syndicated as a part of the various Banana Splits syndicated packages. Young Gullivar and his dog Tagg (There’s always a dog. Are you not paying attention?) are shipwrecked on a mysterious island, which is home to the kingdom of Lilliput (sound familiar yet?). It’s a pretty straight — and unfortunately ordinary — adventure show, although the Lilliputian people are done in a slightly lighter style than the other characters. (They remind me of the much-later HB Smurfs, as there’s only one girl, unfortunately named Flirtatia.) Only 17 episodes were produced, the first of which is presented here. Like lots of other kids, I was watching Wacky Races when this originally aired. Rounding out the 1960s Volume 2 collection is Completely Bananas: The Magilla Gorilla Show, a five-minute documentary only useful for pointing out two things: That Magillia (and Peter Potamus) were really the end of an era of animal character shows for HB (as shows like Space Ghost and Herculoids were waiting in the wings) and that pet store owner Mr. Peebles was probably related to The Jetson’s Mr. Spacely and Wally Gator’s Mr. Twiddle, due to their remarkably similar appearances. Oh, and Mark Evanier claims that Magilla’s theme song was one of HB’s best, to which I agree, even if the song cleverly mentions the show’s original sponsor — Ideal Toys. Volume Two of the 1970s is a bit more problematic, since it unaccountably features three programs that actually debuted in the 1960s as well as including additional episodes of stuff we’ve already seen, like Yogi’s Gang, The Amazing Chan and the Chan Clan, The Adventures of Batman (from Volume 1), and The Bugs Bunny/Road Runner Hour (as previously mentioned, it debuted in 1968). Shazzan is a remarkably cranky and petulant genie, which is probably no surprise since he has to put up with the whims of these annoying kids as well as the flying camel Kaboobie, who “talks” like a proto-Scooby Doo (not surprisingly, both are voiced by Don Messick, HB’s “Dean of Dogs”). The documentary guys also spend a fair amount of time mocking the poor animation and the shortcuts taken (Kaboobie only ever flies from left to right — or the exact opposite when the cells are flopped). 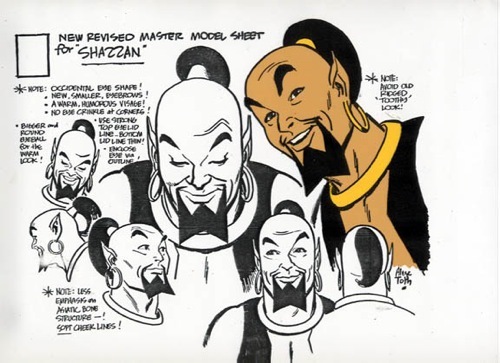 As well as being pretty bad, Shazzan was also pretty violent (the genie doled out some righteous punishment), at least for Saturday morning, and it is frequently cited as one of the shows that stoked the fires of many of the parents’ groups that ultimately neutered Saturday morning cartoons for decades. This violence was later outrageously parodied in an episode of Robert Smigel’s Saturday TV Funhouse, originally broadcast on Saturday Night Live in 2005 and included on the SNL: Best of TV Funhouse DVD. Also debuting — in 1968 — was The Banana Splits Adventure Hour. This is the gem of this collection, as the first episode is shown complete (including some fabulous Kellogg’s commercials starring the Splits) in its original one-hour format. So you also get the first episodes of the animated Arabian Knights and The Three Musketeers, as well as the first episode of the live-action serial Danger Island, starring Jan Michael Vincent, directed by Richard Donner, and introducing “Uh-oh, Chongo!” into the lexicon. (A third cartoon series, Micro Ventures, also appeared, but true to its name, only four episodes were ever produced). Frankly, the cartoons were pretty bland HB adventure-type toons. Danger Island was silly fun, but it never seemed like the series was ever run in order (maybe I was watching them in reruns). Or, perhaps, I was just infatuated with the stars of the show. The Banana Splits (Fleagle, Snooper, Bingo, and Snorky) were live action — basically four guys in cartoon-like animal suits (designed by Sid and Marty Krofft before they got to do their own memorable kid-vid shows), who ran around (and frequently into each other) and performed the worst jokes in the world, usually at a level below the best knock-knock jokes you can think of. Their arch-enemies were the Sour Grapes Bunch, a largely unseen rival “gang” who would send threatening notes to the Splits via one of the Sour Grapes messenger girls. There were apparently five different young girls (all named “Charlie”) who would dance into the Splits clubhouse wearing minidresses and go-go boots and generally intimidate the Splits before handing off the message. The Splits would frequently respond to the challenge, exiting the clubhouse to go to battle and reappear moments later, comically beaten-up in some way. Drooper also had a major problem with taking out the trash (the trash fought back) or delivering advice in his “Dear Drooper” sequences. Occasionally, a Mariachi band (a real band of young girls named The Dilly Sisters) would turn up at their door to play the “Mexican Hat Dance” or some other ditty. This section of the show was largely inspired by Rowan and Martin’s Laugh-In, with silly humor and “blackout” style gags. Eventually, the Splits also added a “Gag Wall,” just like the one used in Laugh-In. But the real reason I was hooked on the Splits was that they were a Monkees-like bubblegum band (their show also being a major influence on the Splits). The Splits’ music was quite good bubblegum. Although it was produced by largely anonymous studio guys, they were great studio guys, like Al Kooper, Gene Pitney, and Joey Levine. One song, “Doin’ The Banana Split”, was an early R&B composition by the great Barry White. The theme song, “The Tra La La La Song (One Banana, Two Banana)” was released as a single and actually charted on Billboard’s Top 100. (For 1 week at #96, but hey! Do you see Scooby Doo on the Billboard charts? Noooooo!) They also released an album in 1969, now highly collectible. Most of us kids got our Splits from the cardboard records on the backs of Kellogg’s cereal or real vinyl EPs that you would send in Kellogg’s box tops for. (I waited by my mailbox for that package from Battle Creek, Michigan for weeks!) Best of all, the TV show offered up proto-rock videos of the Splits performing. Many of these were just the Splits cavorting or running around at amusement parks or driving their cool “Banana-mobiles,” but a few of them were kid-friendly psychedelia at its very best. 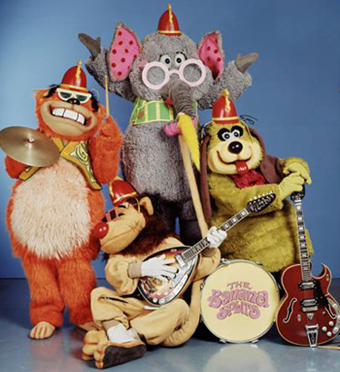 The Banana Splits were goofy and dumb, but they also were very groovy, man. Help! It’s the Hair Bear Bunch! debuted in 1971 as a pretty simple show with a pretty simple premise: Three fun-loving bears — Hair, Bubi, and Square — are always trying to escape from the zoo to have fun. They are opposed by constantly annoyed zookeeper Peevly and his completely inept assistant Botch. The big gimmick of the show was the bears had an invisible motorcycle that was conveniently never explained. Fun, but slight. The New Adventures of Gilligan was the scary harbinger of Saturday morning shows to come (like shows based on Happy Days, Laverne and Shirley, Mork and Mindy, and even SCTV’s Ed Grimley). It was produced by Filmation and featured all of the original cast voices except for Tina Louise (who wanted nothing to do with anything Gilligan) and Dawn Wells (who was unavailable). Because it was Filmation, everybody had to learn something in each episode. Oh, and because it was Saturday morning, Gilligan had a pet monkey, named Snubby, which is what you should do to this very awful show, which originally aired starting in 1974. Premiering in 1972, Sealab 2020 was a very forward-thinking series, produced by Hanna Barbera. As you can probably tell from the title, it dealt with an underwater research base and many fairly new-at-the-time environmental themes. Unfortunately, it was prematurely canceled (probably because it was boring), leaving three completed episodes unaired. It’s probably best known today as being the basis for the proto-Adult Swim series Sealab 2021, where stock footage from the original series was re-used and re-voiced in a mocking way, similar to its companion series Harvey Birdman. Sealab 2021 aired on Cartoon Network from 2000 to 20005 for a total of 52 episodes — 36 more than the original series. 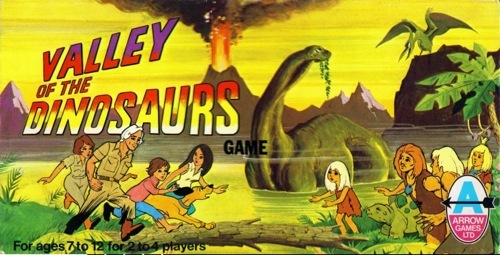 Valley of the Dinosaurs debuted in 1974 (on the same day — and the exact same time — as the similarly themed Land of the Lost). Obviously, Land of the Lost won that particular battle, becoming a cult classic with 43 episodes and three seasons opposed to Dinosaurs‘ two seasons of 16 episodes. But Valley of the Dinosaurs had a couple of interesting things going for it, not the least of which is a relatively large number of females in the cast — a rarity in kid-vid in this era. The premise is simple (and told in the opening sequence): The Butler family (Mom Kim, Dad John, teen daughter Katie, young son Greg, and (of course) dog Digger) have a rafting accident on the Amazon river and are sucked into an underground cavern which opens into a prehistoric valley. There they are befriended by the caveman family (Gorak, his wife Gara, teen son Lok, and young daughter Tana). Interestingly, young Greg is voiced by Jackie Earle Haley, better known today for playing Rorschach in the Watchmen film. 1975’s Tom & Jerry/Grape Ape Show saw the famous cat and mouse team back in the hands of their creators Hanna and Barbera teamed with the dumb Grape Ape. This was the period where the rules against violence were at their most stringent for Saturday morning cartoons, and since violence was the main element of the classic Tom & Jerry cartoons, there were obviously some changes that needed to be made. Thus, this was the beginning of the infamous “red tie” version of the cat and mouse, as Jerry (now wearing a red bow tie) and Tom became pals that went on adventures together. Luckily, the characters were so strong that this didn’t destroy them, but it was just not the same, especially for those of us that grew up with the classic orchestrated violence of the original cartoons. 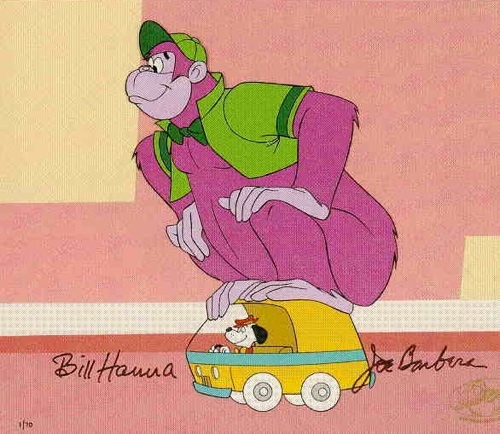 Shockingly , the Grape Ape was a large (40 feet tall) purple gorilla who mostly said his own name a lot and palled around with normal-sized dog Beegle Beagle (pronounced “Beegley Beagley” by Grape Ape) when they weren’t sitting around discussing quantum mechanics. As the Ramones said: D-M-U-B! Yet another 16-episode series from HB. I bet you can’t guess what Inch High Private Eye was all about! That’s all you need to know, really, other than it was yet another HB show, debuting in 1973 and ending the following year with only 13 episodes. After watching this I wished that Atom Ant would come along and beat up Inch. Thus we come to the end of the Volume Twos of Saturday Morning Cartoons. If I had to vote for the shows I would most like to see in their own DVD sets out of this batch of shows (assuming that they can find all the pieces), they would be Quick Draw McGraw, Atom Ant (mostly for Hillbilly Bears! ), The Wally Gator Show (especially Lippy the Lion and Hardy Har Har, if they could only do one), The Amazing Chan and the Chan Clan, Yogi’s Gang (for the novelty of it — although I’d rather see Laff-A-Lympics), and the Banana Splits (even if I could only get the live action Splits and maybe Danger Island). And of course I want more Bugs Bunny and the classic Warner characters cartoons! I’d also love to see more of the Saturday Morning Cartoon series, although I think they’re starting to run out of decent 70s shows that are controlled by Warner (as shown by their sneaking in some 60s shows this time around).